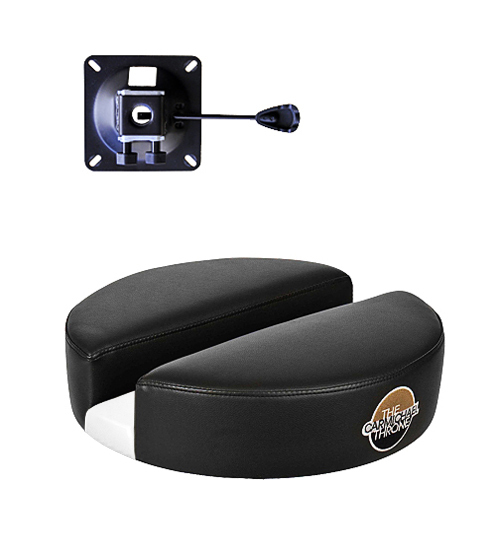 15″ Dia Vinyl Seat Top With Pre-drilled Holes to Fit Carmichael & Roc-N-Soc Seat Mounts. 15” dia. Carmichael Throne Seat Top. This throne is perfect! I had a spinal fusion and needed a throne that would support my back. I have been using this throne off and on and love the design and how it feels when I sit. I would definitely recommend this product to anyone that has a back problem or who has had surgery. 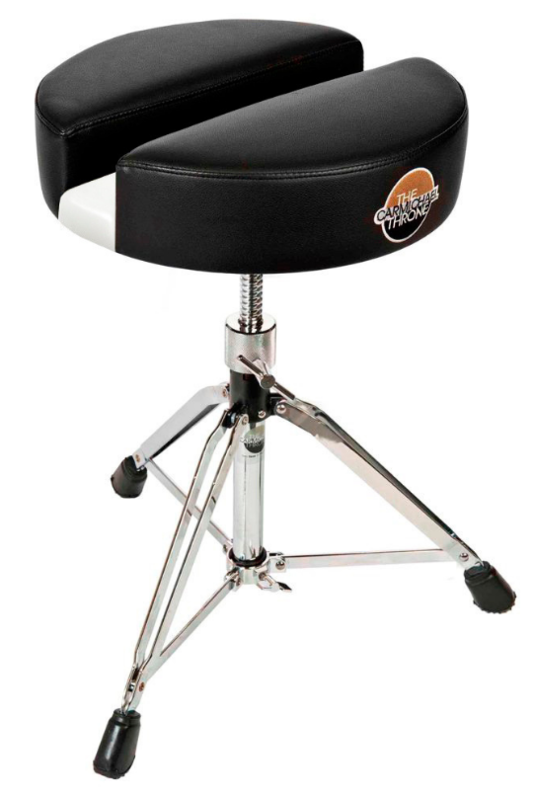 I see other famous drummers using this throne also, and know that if they are using this throne too that it has to be of good quality. I love how it fit my Roc N Soc drum throne without having to get any other hardware. After 30 plus yrs of playing i ended up with back issues. I have 2 bulging discs and spinal stenosis and i thought i was gonna have to give up playing but after doing some research and purchasing The Carmichael Drum Throne , im still at it 2.5 yrs after being diagnosed with back issues. This drum is absolutely amazing and i will not ever play without it!! THE VERY BEST ON THE MARKET!! Do yourself a favor and get one, your Back will thank you!! This Drum Throne is AMAZING! I broke my Back and Neck in a Helicopter Crash while serving in the Army. I had to learn how to walk all over again. I had problems sitting or standing for long periods of time. My legs would go numb after only a few minutes behind the Drumset. Now I am Blessed to be able to enjoy Music once again. Dan Thank You So Much for making such a fine and well crafted product!! Game changer love it..no more 3 set back pain and ballance for days!! After having had a spinal fusion in the lumbar area, I found that using my Roc N Soc Throne did not provide the specific support I needed. It essence, it was too plush. I realized that every time I raised my right leg, even slightly, to play my bass drum, it tipped my spine to the left. Although my major back surgery was a success, playing for extended periods of time would cause a deep soreness in the muscles of the left lumbar region. 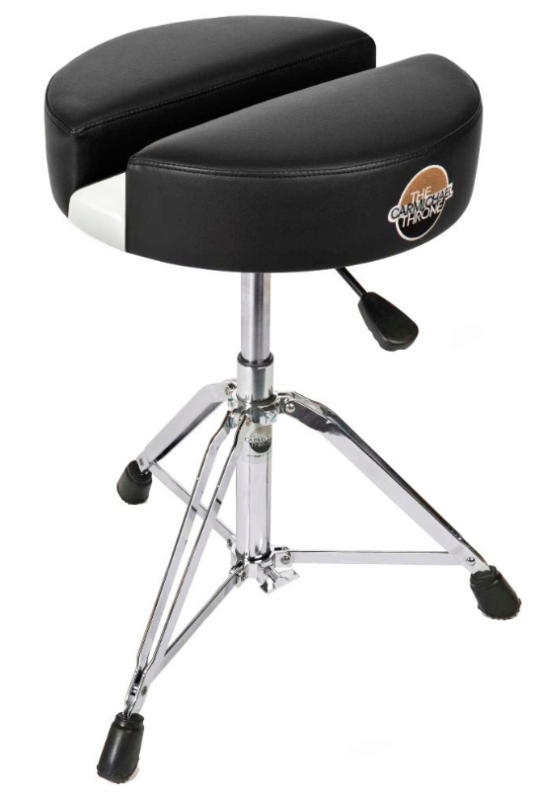 I Googled “drum thrones for drummers with bad backs.” Up popped Carmichael Thrones. I called and spoke with Dan Carmichael who encouraged me to simply buy his seat and bolt it onto the Roc N Soc after removing the plush one. The Carmichael was a Godsend! I immediately noticed that when my right leg came up to play the kick drum, the left half of the seat supported my back perfectly, not too stiff, not too soft. The “split-seat” design allows the “sit bones” to align themselves on the seat, keeping my spine straight. I no longer have any soreness in my back after playing for extended periods. An added bonus is that the opening/channel that runs through the middle of the seat is much easier on my prostate, in fact there’s NO seat pressure on my prostate at all! I use my Carmichael Throne in practice and performance. Because of the Carmichael, there is no longer any damaging pressure on the spine AND prostate. 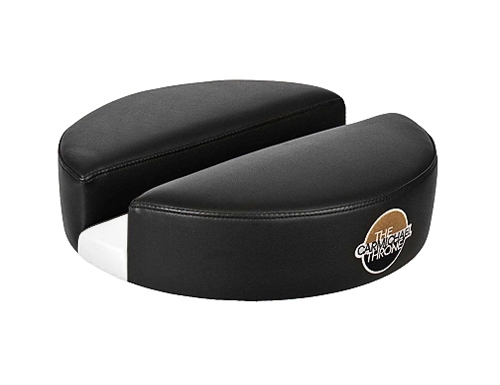 If you have a bad back, you need a Carmichael throne. If you want to SAVE your back ( and prostate! ), you need a Carmichael. I recommend it without reservation. Thank you, Dan Carmichael! I am again playing PAIN-FREE and no longer possibly doing damage to my spine and prostate.